Rubberized Mirrored Malibu Sunglasses will give your brand a new stylish identity. Apart from style and visual appeal, these custom rubberized sunglasses are also loaded with UV400 lenses which will provide 100% UVA and UVB protection. Available in White frame with Silver, Green, Red, Yellow or Blue mirrored lenses, the 2" W x ¼" H imprint area is more than enough to make your brand logo seen. 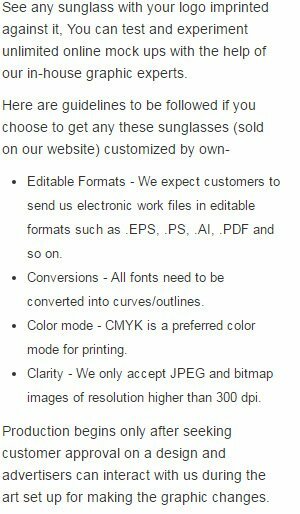 Order these custom sunglasses now to grab our free custom design and free artwork facilities. Request a quote to know the value savings that you can avail on bulk orders of Rubberized Mirrored Malibu Sunglasses. Available Colors: White Frame with Blue, Green, Red, Silver, Yellow Mirrored Lenses. When ordering blank items of this product either exactly 1 or atleast '+125+' must be ordered!